The City of Greeley celebrates artistic expression and encourages public art as a way of celebrating our community's vibrant cultural diversity. The Greeley Art Commission board is made up of volunteers appointed by City Council, representing city wards and personnel from parks and recreation, the planning commission, water and sewer board and Union Colony Civic Center staff. The board oversees the Public Art Programs and assists in discovering art that recognizes and fosters a broad range of social, cultural and historic values that define Greeley. The Greeley Art Commission is guided by the City of Greeley’s 2009 Art Master Plan which guides and supports the integration of art that contributes to Greeley’s identity. The plan also strengthens the city’s commitment to enhance and reinforce the community’s goals, visions, and values through the provision of art. The Art Master Plan has driven major art installations such as the "Go West" art fence installed around Centennial Village, the "Art & Soul" sculpture installed in front of the Union Colony Civic Center, "Flutterby" on 10th Street and 23rd Avenue and the "Uptown Tree" beautification project along the 8th Avenue corridor. The Art Commission recognizes the importance of art forms in public places. The Public Art collection consists of over 350 works of rotating indoor art and more than 160 pieces of outdoor art that have been donated, gifted or purchased since 1967. The collection is continually updated with new artwork as the Art Commission purchases several pieces of art annually. 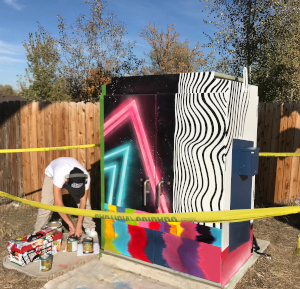 The City of Greeley Art Commission is seeking artistic designs to be painted on Xcel Energy utility cabinets throughout the city. This will spearhead a new pilot program in collaboration with the City of Greeley and Xcel Energy. The first set of utility cabinets will be completed in June 2019. Applicants must be at least 18-years-old and must possess their own liability insurance. Two electrical boxes within the City of Greeley have been chosen for this pilot. It has been determined that one utility cabinet shall be wrapped and one shall be hand painted. Applicants may submit designs for both. Proposed designs must be received on or before Friday, May 10, 2019. 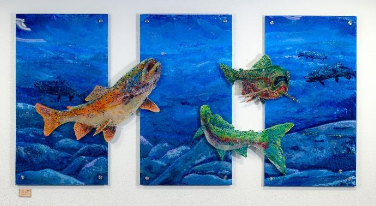 Travis Krause, a Colorado artist and angler at heart,will dedicate the commissioned public art piece, “In the Current,”located at the Greeley Recreation Center, 651 10th Ave., on Friday, April 5 from 5 to 7 p.m.in conjunction with First Friday. This piece is located to the right of the double doors to the pool,allowing visitors to meditate on their relationship with nature when taking a dip into the pool. 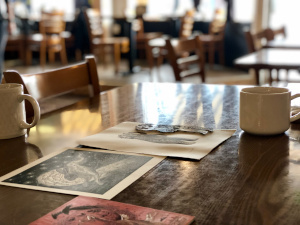 Johanna Mueller, a local printmaking artist and a printmaking instructor at Aims Community College will present her exhibit “Paths and Passage” at the Tointon Gallery, 651 10th Ave., and will be on display Friday, March 22 through Saturday, April 27. “Paths and Passage,” features Johanna Mueller’s detailed animal imagery, created by her use of various printmaking and mixed media techniques. 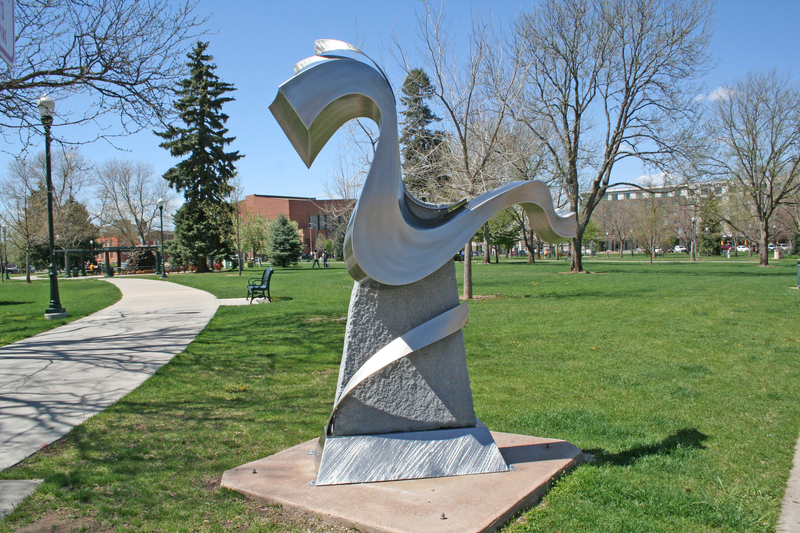 Thanks to the Sculpture on Loan Program, Greeley has a growing collection of public art that is enduring and thought provoking. This year, the program was organized as an invitational and 3 nationally-recognized artists were invited to display up to two pieces each in Downtown Greeley. To make a purchase through the program, contact Kim Snyder at kim.snyder@greeleygov.com. We recognize the importance of art forms in public places and the diversity of the public who appreciates such art. Our collection consists of over 375 works of indoor art and almost 170 pieces of outdoor art that have been donated, gifted or purchased since 1967. To keep the collection updated with current work, we purchase several pieces of art each year. We encourage the donation of public art which is memorable, thought-provoking, enduring and which can be located in a setting appropriate to the environment and the art form. Learn more about our Art in Public Places program and check out our online art catalog. Interested in donating? Complete an Art Donation form.